Philographics is all about explaining big ideas in simple shapes. Now the author of the much-beloved book Philographics has selected 24 of the most popular isms and images and turned them into a postcard book. So you can send out the ones you love best to your friends or just pin them on your wall or frame them. 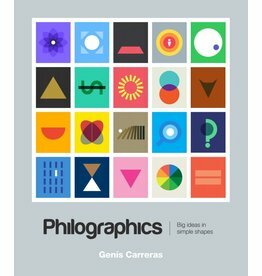 Philographics is conceived as a visual dictionary of philosophy, a compilation of the world's most important isms explained using simple shapes and colours. The project merges the world of philosophy and graphic design, two areas that seem completely opposites: one is heavy and complex, the other eye-catching and easy to consume. "Each image is coupled with a short description explaining the theory, which together create a pleasing, easy to understand visual and verbal definition."